The bears have certainly been aggressive lately and all of the talking heads have their opinion about why this has happened. To me, the reasons why are irrelevant. I don't care to know why the market is tanking. I just know that it is! Ahhhhh - now we can see things a little better! 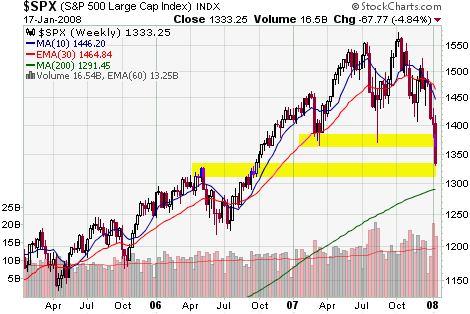 The top highlighted area offered one area of possible support. But it failed. Now we are right at the next level of support. 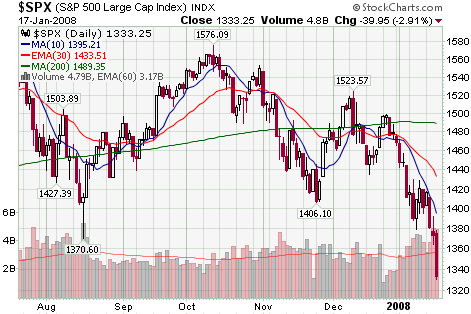 So the market could get a little bounce here. Taking a look at the next higher time frame can give you a little bit of a better perspective on where the market (or a stock) can reverse. On the long side or the short side. Robert Prechter, founder of Elliott Wave International, has some unique charts that he uses to analyze the market. He correctly predicted the 1987 crash so when he speaks, people listen. It is interesting to see how he compares that time to the present. It doesn't look good! You can get more insight from Robert Prechter in the Club EWI section on the Elliot Wave website. If you are not a Club EWI member, you can sign up here (it's free). 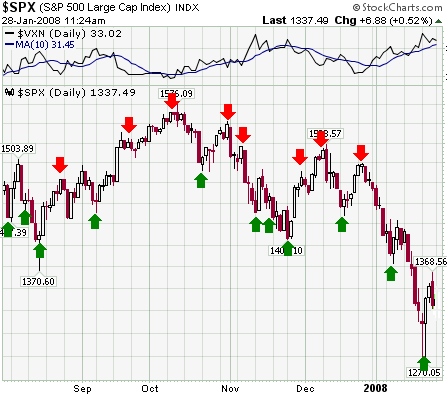 Now, combine that video with the weekly charts of all three major indices. You have a head and shoulders top on all three. Furthermore, a head and shoulders top is one of the most reliable chart patterns known to technical analysts! It looks like we are in for a bumpy ride! On this chart, I have the VIX in the top panel with the 10 period simple moving average added (blue line). You can see that it is generally a good time to go long when the VIX gets extended above the moving average (green arrow). Also, you can see that it is generally a good time to go short when the VIX gets extended below the moving average (red arrow). The further the VIX rises above the 10-period moving average, the greater the likelihood that the market will move higher and the greater the likelihood that this market reversal to the upside will be greater than the average daily move of a normal market. There is one other observation that you will notice right away on this chart. It is more advantageous to a swing trader to go long in an uptrend and short in a downtrend! The swings in the market tend to last longer. Do you try to time your trades to the market? What market timing techniques do you use?